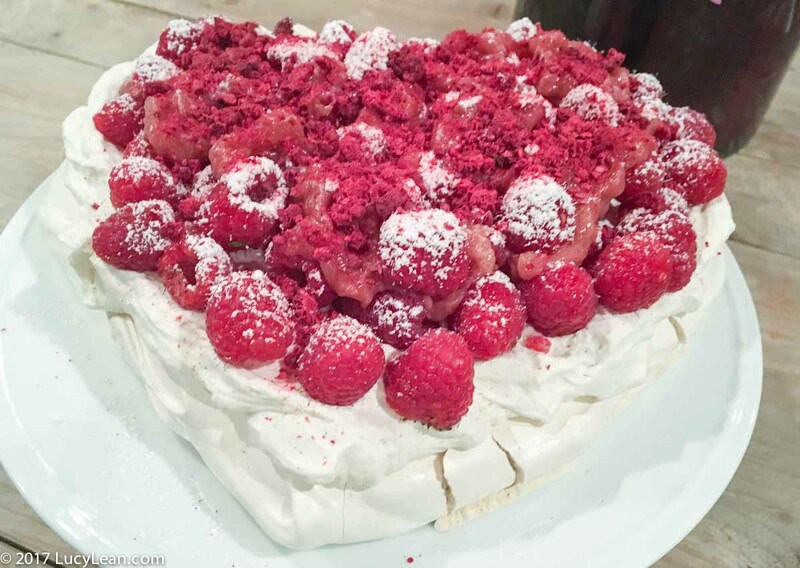 An easy to make show stopping dessert that will brighten up any dinner party; layers of meringue, chantilly cream, rhubarb compote, fresh raspberries and freeze dried raspberries. I love pavlova – a sophisticated version of Eton Mess – meringue, fresh whipped Chantilly cream and fresh fruit that is light, sweet and delicious. 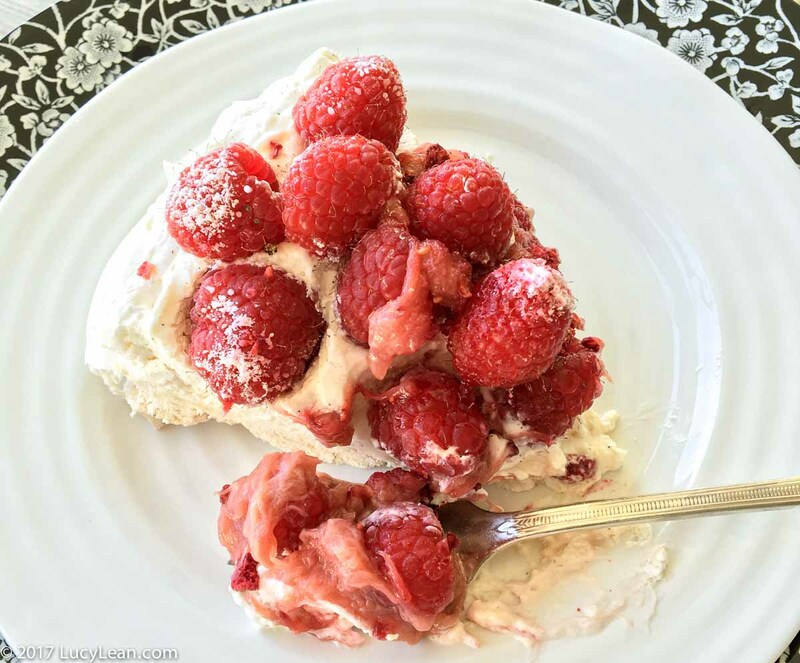 I like to add some acidity and I find a rhubarb compote is the perfect complement to the sweetness of the meringue and I also don’t add a lot of confectioner’s sugar to the Chantilly cream. It’s extremely easy to make and a definite showstopper for dessert at a dinner party. 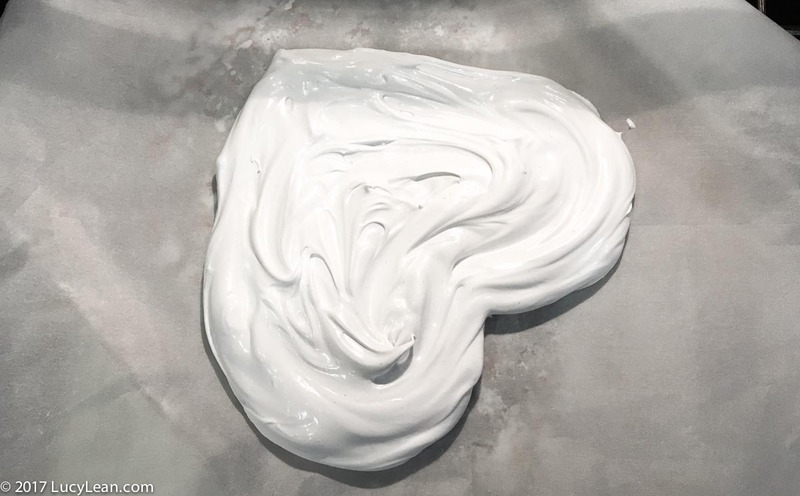 Last night I made it for a mid-week dinner party and shaped the meringue in the shape of a heart. I piled raspberries high with a rhubarb compote and crispy freeze dried raspberry dust. 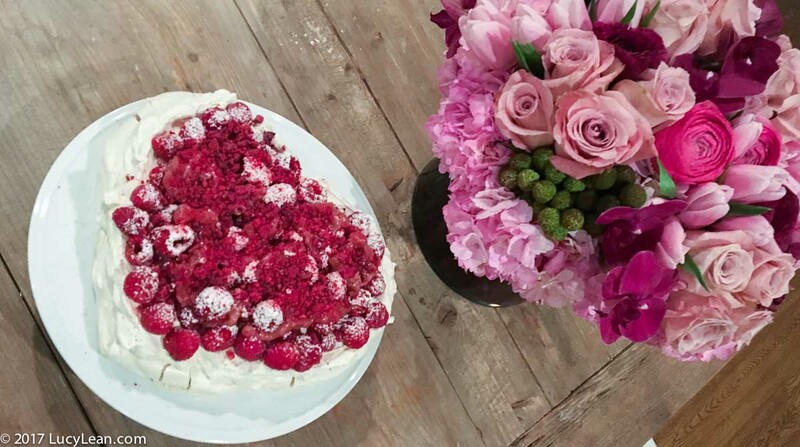 This would make the perfect dessert for a Valentine’s supper. 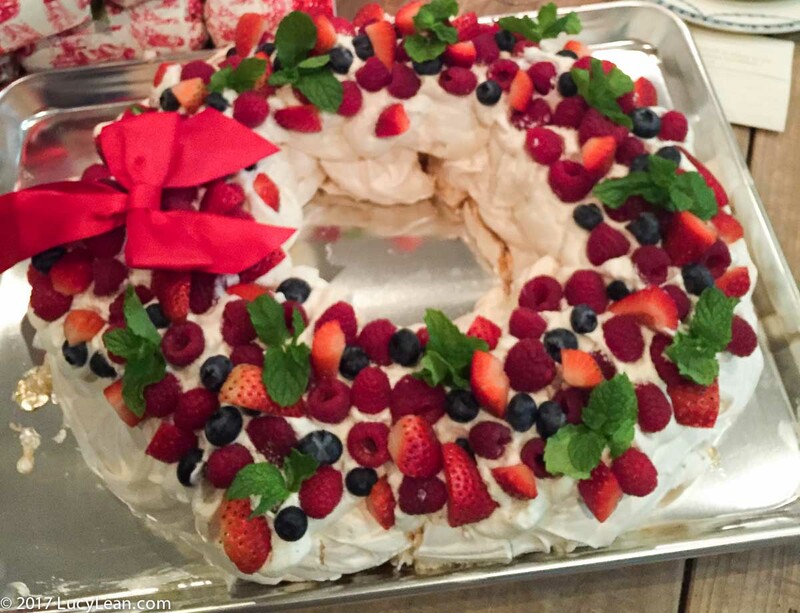 In the past I have made it for Christmas and shaped the meringue in a large circle for a delicious and pretty wreath – adding mint leaves and red raspberries and strawberries for a festive holiday desert. 5. 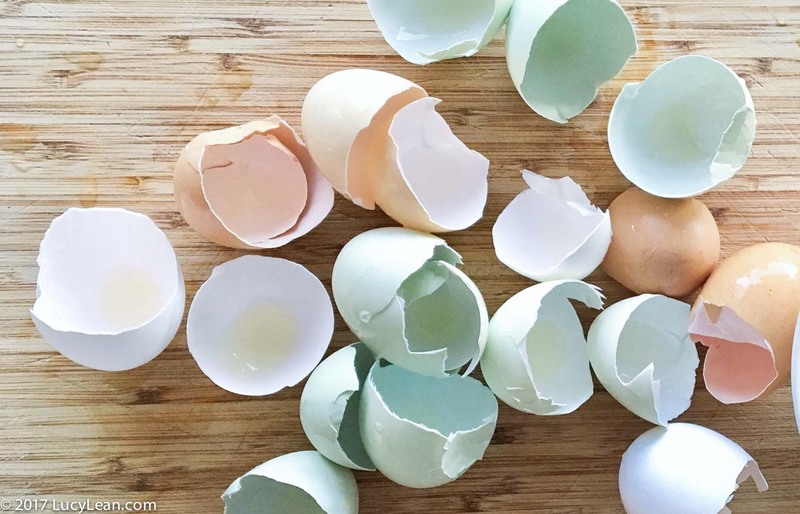 Place the meringue onto a parchment sheet of paper and shape accordingly – heart, wreath or regular round. On another baking sheet with parchment sheet using two spoon make regular meringues in balls about the size of an apple. 6. Place in the oven (230F) for about 2 hours. When they are done the meringue will lift off the tray, the outside will be firm and the inside still a little soft. Turn off the heat and leave to cool in the oven. This prevents the meringues from cracking as they cool. 7. 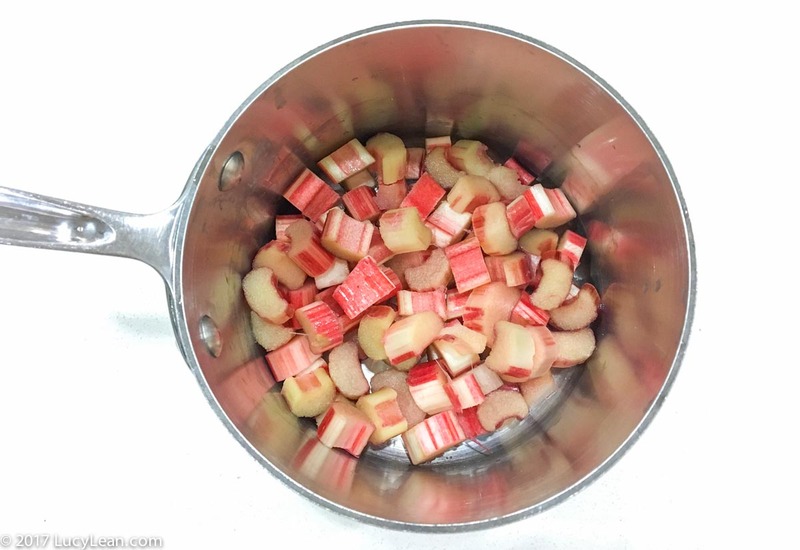 Make the rhubarb compote by placing the cut up rhubarb in a pan with 1/4 cup of water and 2 tablespoons of sugar. Cook over a low to medium heat for about 30 minutes until the fruit is cooked and the liquid has reduced down to a sticky delicious pink compote. 8. 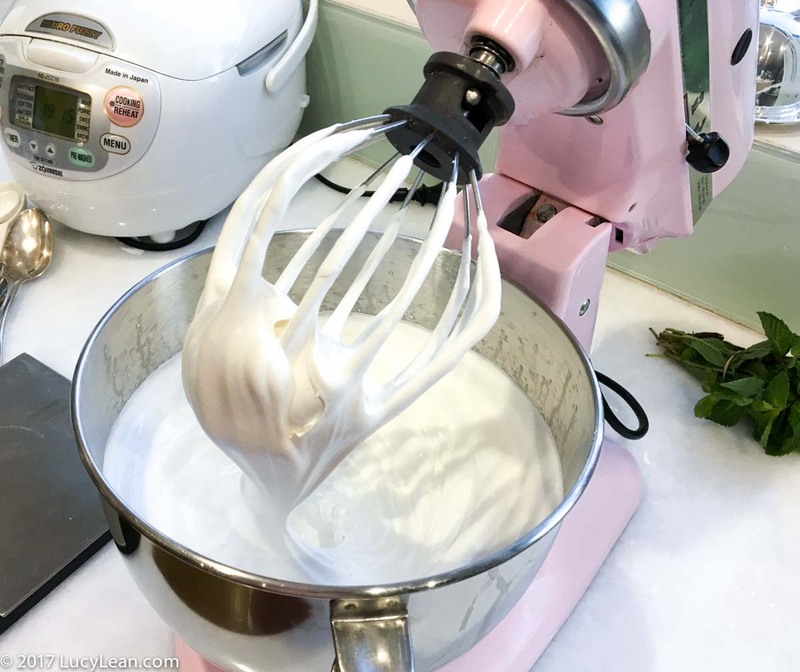 To make the Chantilly cream place heavy cream in bowl of Kitchenaid and whisk for about 2 minutes. Add confectioners sugar and 2 teaspoons of vanilla paste. Whisk until cream thickens being careful not to over whip. 9. 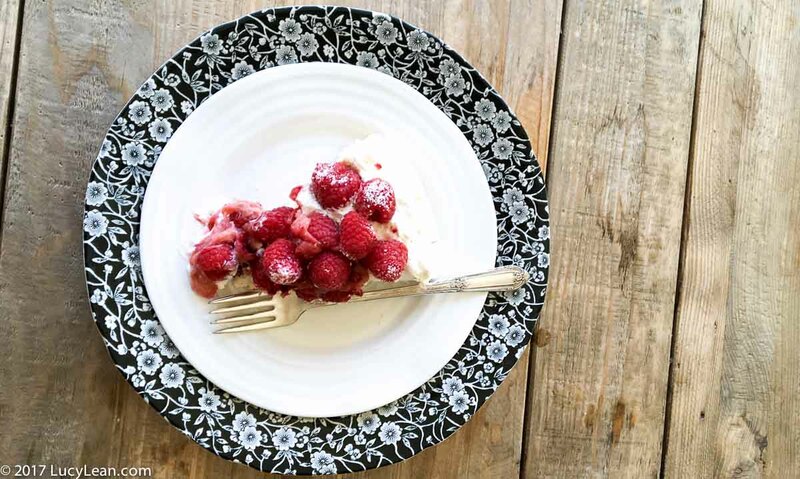 To compose the pavlova place the cooled meringue on a cake platter and spread the Chantilly cream on top, add fresh raspberries and the cooled raspberry compote. Sprinkle crushed freeze dried raspberries on top and serve. The dessert will keep in the refrigerator so if you need to make it up in advance of a dinner party then do, just save the freeze dried raspberries until you are about to serve so they retain their crunch.